Desembarque de su crucero y luego suba a un cómodo vehículo para el corto viaje a la selva tropical de la isla de Roatan. 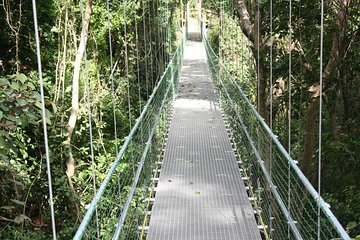 A su llegada, emprenda su emocionante paseo ecológico por la fascinante flora y fauna del paisaje; siga caminos pavimentados que conducen a ocho puentes colgantes diseñados dinámicamente y contemple la exuberante cubierta de abajo. Ascienda a alturas de hasta 85 pies (26 metros) y explore el paisaje en busca de criaturas camufladas como iguanas, lagartijas y aves exóticas. Permita que su guía dirija su atención a especies de plantas raras como el árbol Gumalimba, ya que se balancea suavemente con la suave brisa del océano. Después de una hora de exploración enriquecedora, regrese a su vehículo y aventúrese a las suaves arenas de West Bay Beach. Pase hasta tres horas disfrutando de un entorno idílico, hundiendo sus dedos en la arena blanca en polvo o sumergiéndose en las aguas cristalinas del océano. Alquile sillas de playa y equipo de snorkel para explorar debajo de la superficie del mar y revitalizar con bocadillos y bebidas en un restaurante local (por cuenta propia). Secarse y regresar a su vehículo para el viaje de regreso al puerto y llegar mucho antes de la salida de su crucero. Excursión por la costa sin preocupaciones Le garantizamos el regreso oportuno a su puerto de cruceros en Roatan para esta actividad. En caso de que su barco haya partido, coordinaremos el transporte al siguiente puerto de escala. Si su envío se retrasa y no puede asistir a esta actividad, su dinero será reembolsado. Vea nuestros términos y condiciones para más detalles. Our excursion started with being driven by our diver Victor (I think was his name) in an old minivan along with another family to the suspension bridges/zipline tour. We did the bridges while they did the zipline. The tour was ok. The bridges were not as high as I thought and hoped. The guide seemed in a rush and cold but warmed up once we started talking to her and asking questions. Once the tour was done, we needed to wait for the other family. We were taken back to the starting point where the driver drove us to the beach part of the tour. Before walking to the beach the driver asked us how long we wanted to be there and he would pick us up. We decided on 2 hours as we wanted time to get to the port on time. The beach was beautiful, definitely a 5 star. We spent time there and at the pool. Ordered some drinks which I was surprised that I had to pay for as the tour was supposed to include welcome drinks which I never received. I asked the waiter and was told I needed to pay and i did. We were waiting with the other family for the driver who never showed up. We called the tour company office and the said the would look into it and nothing happened. We saw his minivan but no sign of him. We called again and was told he is on his way but never saw him. Finally after waiting for an hour another driver for the same company told us he can drive us. He was not sent for us but said he is able to take us but needed to make one stop first. We got back just in time. I wanted to walk around the port a bit but no time for that. To sum it up, the excursion was good, beautiful beach, the service from the driver and tour company was horrible. Also, not sure what happened to my welcome drink? I would suggest that Viator use a different tour company for this excursion. Absolutely loved Roatan, and this trip. Unfortunately we did not see much wildlife, but the vegetation was wonderful and my guide's commentary very interesting. The beach was beautiful, and I had free use of a subbed and a complimentary fruit punch. Sea was incredibly clear and beautiful. Would love to return to Roatan. 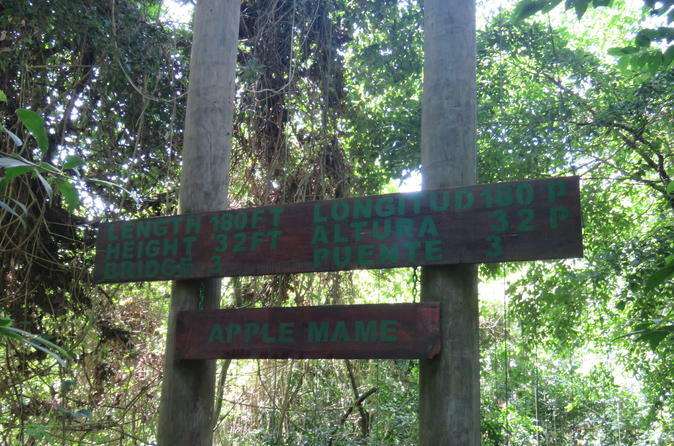 Next time I will do the large zip line at the Hanging Bridges site - looks awesome! It is about a 1/2 hour shuttle trip to the excursion. That was good in that it gave us a glimpse of life on Roatan. The excursion itself was a pleasant, easy hour-long walk through a tropical jungle. Our guide kept up a patter about the wildlife and the plants including information on how some of the plants had medicinal qualities. The jungle walk was followed by a long stay at one of Roatan's white sand beaches. Don't forget your swim trunks!!! We did and so we were restricted to wading into the clear, warm water. There are vendors selling from sheds and others walking up and down the beach selling drinks, sea shells, hats, and various trinkets. Be sure to bargain if you buy as asking prices start at as much as 4X what you'd pay at a gift shop. When we took this excursion, one drink ticket was included in the tour. Sitting in the shade of a palm tree, watching the waves come in, and sipping a cold beer is an experience you will remember fondly. This was a relatively inexpensive and enjoyable way to spend time on the island. The eco tour is quite short, 30 minutes top, and really not much to see. I can't say anything about the beach, as I did not go to the beach. Instead, I paid extra for the zip line, which is quite good. My advise is to skip the eco tour and go for the zip line. For Naturalist we were looking forward to seeing birds, snakes, and other numerous wildlife. The area is surrounded by the many tourist zipping across overhead, screaming at the top of their lungs. The guide was very knowledgeable of the plant life in the area, I would assume of wildlife if there was any. One small red butterfly the whole tour. Now the swinging bridges are well maintain and we enjoyed them, except the broken serenity of tourist screaming over head and destroying the chance of seeing any wild-life.. Pick up booth was easily located, personnel helpful and informative. They have it down to a system. Enjoyed being taken care of and not worrying how to get around an island that had some political issues brewing for Saturdays protests. 87 steps on the way back up so participants need to be very mobile. Bus ride was along a potholed highway so those with back issues should not participate. The staff did inform us that due to the zip lining activity above the bridges the animals were no longer that visible and were in hiding. We did see 1 iguana high in a tree. Enjoyed the informative flaura and fauna information from the tour guide, leaves that seep milk, bat poop, poison and healing medicinal leaves and herbs. Buses brought us to beach for hours of beach fun that you can do at a separate cost to the beach vendors such as snorkeling, massages, etc and then back to ship in a timely fashion. Very knowledgeable friendly helpful guide! We enjoyed the stroll through the jungle. The only problem I personally had was with many steps. If you truly have problems with stairs this tour is probably not a good choice. had to wait 40 minutes before tour started after arriving at location. Not enough staff available. Hanging Bridges was just ok. Beach was wonderful and how driver to the beach and back to shore was great. Rained most of the time .... making the wooden areas a little slippery .... gotta be careful, but the experience above the trees was exciting. Really neat to over look the trees to the depth below .... I recommend this excursion. We had 4 of us that booked this instead of getting paying exorbitant prices for a cruise ship excursion. The meeting point was basically right off the boat in port, and we were on our way within 10min. We had our own private guide for this excursion, and she was amazing! She took her time guiding us through the jungle showing us all the beautiful trees and plants, and the medicinal properties that the locals use them for. Absolutely fascinating! After that, we hopped on an open air truck back to the original starting location and grabbed a cold, local beer on top of the mountain while we waited for our driver. The 2nd part of the excursion dropped us off at a beautiful resort with a picture perfect beach, complementary lounge chairs, full use of their restrooms/showers, and a restaurant we enjoyed for lunch not included. Absolutely LOVED Roatan and can't wait to come back here for a proper vacation. Highly recommended!! !